Renault add to their line-up of electric commercial vehicles, revealing their new Renault Master ZE, ideal for last minute urban deliveries. Renault look to further bolster their market leading electric LCV line-up, adding the Master ZE alongside their existing Kangoo ZE and Twizy Cargo models. As Europe’s leader in electric vehicles, Renault have plenty of experience to bring to the new vehicle. The Master ZE will benefit from this knowledge. featuring a next-generation battery that makes it ideal for emissions-free deliveries to urban city-centres. The Master ZE features an electric motor, borrowed from their Zoe, outputting in 76PS and a capable top speed of 71mph. As most EVs the Master will also be quick to accelerate, thanks to 225Nm of instantly available torque. It will feature a 33kWh battery which will offer 124 miles range when the van is empty, though a real world usage is more likely to be around 74 miles. Charge times from empty to full are quoted at just 6 hours. The Renault Master ZE is available in a wide range of variants. This includes the panel van with three wheelbase and two roof height options or a chassis cab in long wheelbase format. Load lengths of 2,583mm, 3,083mm and 3,373mm and load heights of 1,700 and 1,8964mm are available with a standard load width of 1,765mm. The access height and load volume remains the same as that in the diesel Master, thanks to some clever engineering on Renault’s part. The electric battery is mounted where the gearbox would be on the conventional model, ahead and underneath the load floor. The new electric van also offers the latest fleet technology from Renault via their Easy Connect Solutions. This includes several helpful features starting with ZE trip which help drivers locate charging points via the R-Link navigation system. A smartphone application is also available to view the vehicles range, whilst ZE Pass offers a single payment for drivers to use most public charge points across European countries. The Renault Master ZE will be available to lease towards the end of the year. If you are looking to lease a Renault Van in the mean time, take a look at our offers. With over 36 years of lease experience we are one of the most established brokers in the industry. Our leasing consultants offer a flexible and consultative approach, focusing on providing great customer service over our own profits. 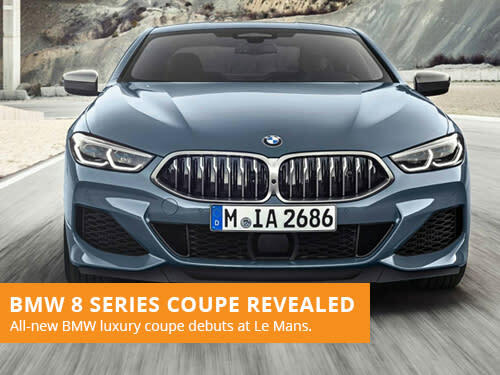 After much anticipation, BMW have finally revealed the all-new BMW 8 Series Coupe, with the luxury coupe making a grand debut at Le Mans.